Dr. Travis Lamperski, is the chiropractor after a car accident to contact with any questions. Car collisions happen all too often. Think about it–how often do you hear about major collisions on the highway? The answer is probably frequently. Unfortunately, many accidents leave drivers with crippling pain that impacts their everyday life. Automobile accidents can happen to anyone. You may hesitate to contact a chiropractor after a car accident. If you’re a victim of a collision, visit our auto accident chiropractor for complete, comprehensive care. Auto accidents are responsible for injuring more of our patients than anything else. Backed by many decades of experience, Dr. Lamperski knows how to treat these types of injuries. As a seasoned auto accident chiropractor, he can alleviate the sharp pain you experience in the immediate aftermath of an accident, as well as the lingering pain that can persist for years. If you are searching for car injury chiropractors, make our practice your first choice. Like many, you may think that you won’t be involved in an accident. The fact is that even the most experienced drivers can have accidents that can lead to lingering pain and injuries. Fortunately, our caring auto accident chiropractor is here to diagnose and treat the underlying cause of your pain. Insurance companies realize the many advantages of Chiropractic care. This treatment is generally covered in full by auto insurance policies that include med-pay, whether you are a driver, a passenger, or a pedestrian… and regardless of who is at fault. Our clinic will assist you in dealing with insurance paperwork and filing a claim with your insurance company. This treatment is generally covered in full by auto insurance policies that include med-pay. If you or a loved one has been involved in an auto accident in Palm Beach area – even if there are no obvious symptoms – should make an immediate appointment with Palm Beach Chiropractic and Rehabilitation. The damage from spinal nerve stress may take months or even years to surface. Seeing a chiropractor after a car accident and having a simple chiropractic exam and proper treatment can save an accident victim from much pain and disability later. Should I see a chiropractor after a car accident? The short answer, yes. The DMV, also says that seeking medical attention after a car accident is the best thing for your health and if you decided to file an injury claim. There are more reasons why. Injuries may not be noticeable right away. There may be broken bones or cuts that could be noticeable, yet some injuries may not be as noticeable. The main example would be whiplash. 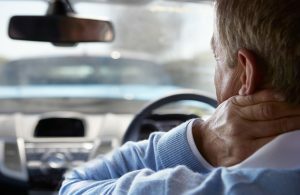 There are over 350,000, car accidents each year in the state of Florida, some are minor and others more severe, but many of these accidents lead to whiplash and neck injuries. The neck is extremely vulnerable to this type of trauma because of its ability to move in multiple directions. Whiplash is most commonly associated with motor vehicle accidents in which the heads of those in the front car are suddenly snapped back and forth by the impact. It is more accurately called cervical acceleration/deceleration (CAD) syndrome. High-speed rapid movements can injure the vertebrae of the neck and the muscles and ligaments that support them. This leads to inflammation and muscle spasm, which in turn causes not only nerve irritation and pain, but more importantly, results in the formation of soft tissue adhesions. A chiropractor can, in most cases, significantly reduce patients’ distress and allow them to return to their normal activities. If you have been in a car collision and need a professional to examine the severity of your damage, Palm Beach Chiropractic and Rehabilitation is experienced in rehabilitating people involved in car accidents and experiencing whiplash or neck injury symptoms. Dr. Travis Lamperski, is the chiropractor after a car accident to see if you are having any questions or doubts about whether you should see a chiropractor. Feel free to call our office with any questions. You may be injured and not know it. Injuries such as whiplash usually may not show any symptoms for hours, days or even weeks later. Medical professionals agree that the first 72 hours after an accident are critical and the time treatment can be most effective. Many injuries from automobile accidents occur at speeds of 6-12 MPH. Cars are designed not show much damage, but your body might. A soft-tissue injury can be permanent. Scar tissue can form in your muscles leaving them less flexible and prone to re-injury in the future without treatment. Getting prompt medical treatment preserves your legal rights and supports any claims you might make regarding accident injuries that involve insurance companies and legal counsel. In most cases, treatment can cost you nothing out of pocket, even if you don’t have any health insurance. Statistics show the longer you wait for treatment after you are injured, the longer it takes to heal and more treatments are required. Many injuries will not heal on their own. Prompt functional treatment can restore normal function and prevent complications in the future. Emergency room personnel specialize in treating life-threatening injuries and more visible injuries like broken bones, cuts, and bruises. When it comes to injuries like soft tissue trauma and whiplash, an emergency room exam may not find the problems. Dr. Travis Lamperski, is the chiropractor after a car accident to contact with any questions.